Today, we’re announcing several new Microsoft 365 enhancements to help IT reduce costs, increase security, and boost employee productivity. Windows Virtual Desktop is now in public preview, providing the best virtualized Microsoft 365 experience across devices. Microsoft Defender Advanced Threat Protection (ATP) now supports Mac, extending Microsoft 365 advanced endpoint security across platforms. The new Microsoft Threat and Vulnerability Management (TVM) capability in Microsoft Defender ATP will help detect, assess, and prioritize threats across endpoints. Office 365 ProPlus will now include the Microsoft Teams app, enabling a new way to work. We’re reducing the time it takes to apply Windows 10 feature updates, making it easier to deploy and service Windows 10. We’re enhancing Configuration Manager and Microsoft Intune with new insights and deployment options to make it easier to manage your devices across platforms. Microsoft 365 admin center is now generally available. Today, we’re happy to announce the public preview of Windows Virtual Desktop. Windows Virtual Desktop is the only service that delivers simplified management, multi-session Windows 10, optimizations for Office 365 ProPlus, and support for Remote Desktop Services (RDS) environments in a shared public cloud. With Windows Virtual Desktop, you can deploy and scale your Windows desktops and apps on Azure in minutes, with built-in security and compliance. For more information about Windows Virtual Desktop or how to get started with the public preview, read the full announcement and watch the new Mechanics video. New today, we’re extending support for our Microsoft Defender threat protection platform to Mac. And because we’re extending support beyond the Windows ecosystem, we’re renaming the platform from Windows Defender Advanced Threat Protection (ATP) to Microsoft Defender Advanced Threat Protection (ATP). Starting today, Microsoft Defender ATP customers can sign up for a public preview. For more information, visit our Tech Community blog. We’re also announcing Threat and Vulnerability Management (TVM), a new capability within Microsoft Defender ATP, designed to empower security teams to discover, prioritize, and remediate known vulnerabilities and misconfigurations exploited by threat actors. Using TVM, customers can evaluate the risk-level of threats and vulnerabilities and prioritize remediation based on signals from Microsoft Defender ATP. TVM will be available as a public preview for Microsoft Defender ATP customers within the next month. Learn more about it in our Tech Community blog. Today’s security announcements are an important milestone in our Microsoft 365 endpoint security journey. For more details, check out Rob Lefferts’s post on the Microsoft Security blog. Starting in March, new installs of Office 365 ProPlus will include the Teams app by default. As a “hub for teamwork,” Teams combines chat, voice, video, files, meetings, and calls into a single, integrated experience. In addition, the default installation for ProPlus will now be 64 bit, enabling better reliability and more effective use of newer PC hardware. If you have earlier 32-bit installs, a soon-to-be-released in-place upgrade from 32-bit to 64-bit Office 365 ProPlus will allow you to upgrade the Office apps without uninstalling and reinstalling. We made important changes to the Windows update process. Starting with Windows 10 version 1709, devices are updating up to 63 percent faster. Additionally, with the release of Windows 10 version 1703, we’ve seen a 20 percent reduction in operating system and driver stability issues. Configuration Manager current branch offers CMPivot for real-time queries and updates to management insights that help with co-management readiness. What’s more, you can now take advantage of new deployment options, including phased deployments and configuring known-folder mapping to OneDrive. Mobile Device Management (MDM) Security Baselines are now in preview in Intune. These baselines are a group of Microsoft-recommended configuration settings that increase your security posture and operational efficiency and reduce costs. We’re also announcing several new Intune capabilities for unified endpoint management across devices and platforms. Check out What’s new in Microsoft Intune and Configuration Manager for more detailed information on our broad unified endpoint management investments. We’re also announcing the that the new Microsoft 365 admin center, previously in preview, will become the default experience for all Microsoft 365 and Office 365 admins. Admin.microsoft.com is your single entry point for managing your Microsoft 365 services and includes new features like guided setup experiences, improved groups management, Multi-Factor Authentication (MFA) for admins, and more. For more information on this new release, check out the detailed post on the Microsoft 365 Tech Community blog. We’re sharing more on each of these announcements this week at Microsoft Ignite: The Tour in Amsterdam. I’ll be there to co-present a session with Jeremy Chapman on “Simplifying IT with Windows 10 and Office 365 ProPlus.” You’ll have a chance to learn more from many of my colleagues in the teamwork, modern desktop, and security sessions. I hope to see you there! Blog post was updated to correct information regarding Configuration Manager current branch. Wales is helping nearly half a million young people improve their digital skills by becoming one of the first countries in the world to give all local authority schools free access to Microsoft 365. The Welsh Government will pay for all 1,521 “maintained” schools to have access to programs such as Word, Excel and PowerPoint, in a bid to boost the use of technology among pupils and reduce costs for families and headteachers. As part of the £1.2 million investment, which is expected to benefit around 467,000 young people, all teachers and students will be able to download and install the latest version of Office 365 ProPlus on up to five personal devices. Pupils can then collaborate and continue learning at home using the same programs as they do in the classroom. Kirsty Williams, Minister for Education, said: “I’m proud to say we’re one of the first countries in the world to take this progressive approach to providing schools with this software. Through our curriculum reforms we want all learners to have relevant high-level digital, literacy and numeracy skills, and access to these applications is an important step towards achieving that. The deal also includes Minecraft: Education Edition, which contains Code Builder. This version of the popular block-building game will allow teachers and students to learn coding using Tynker and Microsoft MakeCode, and supports the Welsh Government’s Cracking the Code plan to encourage coding in every part of the country. Users will be able to securely access Office 365 ProPlus in Welsh or English via the government’s Hwb digital learning platform, which is available to all maintained schools and actively used by more than 85%. Online versions of the software will continue to be available through Hwb for use in public spaces such as libraries. Cindy Rose, Chief Executive of Microsoft UK, said: “The introduction of Office 365 will be transformational for both teachers and pupils, empowering them to collaborate more effectively, saving time and generating better learning outcomes. Equally, Office 365 provides students with valuable skills to help them obtain employment following school. The Office deal comes just days after the Welsh Government announced that Flipgrid, the social and personal learning program used by millions of teachers in more than 180 countries, will also be available to schools in Wales via Hwb. Flipgrid lets teachers see and hear from every pupil in their class by posting questions to online discussion boards, called grids. Students answer by creating short videos but can practice and perfect their response before posting, helping to increase confidence and improve public speaking. The move to make Office 365 ProPlus and Flipgrid available to schools will support the Welsh Government’s Digital Competence Framework (DCF), which was launched in 2016 and aims to help people develop the skills that will help them thrive in an increasingly digital world. According to the US Department of Labor, 65% of today’s students will end up working in jobs that don’t exist yet, and more than 500,000 highly-skilled workers will be needed to fill digital roles by 2022 – three times the number of UK computer science students who graduated in the past 10 years. Just 5% of computer scientists are female, while people returning to work and those from black and minority ethnic backgrounds are also vastly underrepresented within the sector. The DCF aims to tackle this issue by setting out the digital skills to be attained by students aged between three and 16, including communication, collaboration, creativity, data, problem solving and online behaviour. Last September, we announced Windows Virtual Desktop and began a private preview. Since then, we’ve been hard at work developing the ability to scale and deliver a true multi-session Windows 10 and Office 365 ProPlus virtual desktop and app experience on any device. Today, we move to the next phase and announce the public preview of Microsoft Windows Virtual Desktop. Now, all customers can access this service—the only service that delivers simplified management, a multi-session Windows 10 experience, optimizations for Office 365 ProPlus, and support for Windows Server Remote Desktop Services (RDS) desktops and apps. With Windows Virtual Desktop, you can deploy and scale your Windows desktops and apps on Azure in minutes and enjoy built-in security. Through our private preview, we had the chance to work closely with customers and partners to help shape this new service. It has been rewarding to see the results so far—a great example being at X5 Music Group, a Warner Music Group company. As we start public preview, we’ll continue listening and taking feedback, to ensure we’re meeting your needs as we head toward general availability in the second half of calendar year 2019. With the end of extended support for Windows 7 coming up in January 2020, we also understand some customers need to continue to support Windows 7 legacy applications as they migrate to Windows 10. To support this need, you’ll soon be able to use Windows Virtual Desktop to virtualize Windows 7 desktops with free Extended Security Updates (ESU) until January 2023. This support provides a comprehensive virtualization solution for Windows 7 alongside your Windows 10 and Windows Server desktops and apps. In November 2018, we acquired FSLogix, a next-generation app-provisioning platform that reduces the resources, time, and labor required to support desktop and app virtualization. FSLogix technologies enable faster load times for non-persistent users accessing Outlook or OneDrive. FSLogix technology will support both client and server RDS deployments—helping on-premises customers more easily migrate to Windows Virtual Desktop and providing a great solution for customers in hybrid scenarios. Through our partnership with Samsung, Windows Virtual Desktop will provide highly mobile Firstline Workers access to a full Windows 10 and Office 365 ProPlus experience with Samsung DeX. To deploy and manage your virtualization environment, you just need to set up an Azure subscription. You can choose the type of virtual machines (VMs) and storage you want to suit your environment. You can optimize costs by taking advantage of Reserved Instances (up to 72 percent discount) and by using multi-session Windows 10. For users accessing the Windows 10 and Windows 7 desktops and apps, there’s no additional cost if you’re an existing Microsoft 365 F1/E3/E5, Windows 10 Enterprise E3/E5, or Windows VDA customer. For Windows Server desktops and apps, there’s no additional cost if you’re an existing Microsoft RDS Client Access License (CAL) customer. Windows Virtual Desktop is comprised of the Windows desktops and apps you’re delivering to users and the management solution hosted as a service on Azure by Microsoft. During public preview, desktops and apps can be deployed on VMs in any Azure region, and the management solution and data for these VMs will reside in the United States (US East 2 region). This may result in data transfer to the United States while you test the service in public preview. We’ll start to scale out the management solution and data localization to all Azure regions starting at general availability. For more information on getting started, considerations for optimal deployment guidance, and to provide feedback as you preview the service, please visit the Windows Virtual Desktop preview page. Our government agencies have a unique opportunity to deliver massive impact on the lives of U.S. citizens – an impact that can be accelerated and emboldened by technology innovation. However, these same agencies are challenged to modernize and keep pace with the changing technology landscape, while simultaneously reducing costs, protecting data and meeting stringent compliance regulations. To ensure the government can achieve its critical, mission-driven work, and improve citizen services, hundreds of CIOs and top decision-makers from federal, state and local government agencies are turning to secure cloud infrastructure, which can seamlessly enable operations efficiencies, and provide services that are faster, more reliable and more secure. Right now, we’re seeing the evolution across U.S. government from a Cloud First approach – with an emphasis on just getting everything in the cloud – to a Cloud Smart approach – with a focus on embracing modern capabilities and equipping agencies with the technology tools needed in accordance with their mission needs. The recently revised Federal Cloud Computing Strategy is the first cloud policy update in seven years. We believe it constitutes more than labelling and is the right way forward to make the most of the incredible possibilities of cloud in advancing agencies’ missions. In recent years, commercial technology has increasingly found a foothold in the government market and Cloud Smart embraces best practices from both the federal government and the private sector. Cloud Smart is about equipping agencies with the tools, knowledge and flexibilities they need to not only move to cloud, but to fully embrace the potential of its many value-added capabilities such as Platform-as-a Service (PaaS) and Artificial Intelligence. All government cloud offerings are not the same, and Microsoft is committed to supporting the needs of government across all branches and levels enabling them with capabilities that support the advancement of their mission from end to end. We’ve built the most trusted, comprehensive cloud for government which includes Azure Government, Microsoft 365 Government, and Dynamics 365 Government. Government organizations across the United States increasingly are turning to our powerful cloud offerings to modernize – becoming more productive, collaborative and efficient all while protecting sensitive data and privacy. Microsoft is delivering them the right capabilities where they are needed, when they are needed as the sole provider with offerings that span infrastructure, platform and software capabilities and services (IaaS, PaaS and SaaS) designed to meet government’s unique compliance needs. To make it easier for agencies to efficiently modernize quickly and accelerate the speed in which they achieve a return on their cloud investments, Microsoft has worked with our government customers to achieve the most certifications of any cloud provider with more than 91 compliance certifications supported at every level of government to help them achieve their necessary requirements. We also invest $1 billion dollars per year on security and much of that goes to ensuring we deliver our customers the most trusted cloud platform. Since launching Microsoft 365 Government last year, we’ve continually made investments to empower government with the newest tools for mobile productivity and secure collaboration, bringing together the best of Office 365, Enterprise Mobility + Security (EMS), and Windows 10 to meet agencies’ complex compliance and security requirements. Today, we’re announcing Microsoft Teams, a product core to our vision for delivering intelligent and modern collaboration and communications, is now available in our Government Community Cloud (GCC) High and Department of Defense (DoD) environments exclusively for the U.S. government and its partners. This means Teams is now available across all our government cloud environments including GCC. Microsoft Teams’ chat-based workspace enables teams of government professionals to be more productive by giving them a single and secure location that brings together everything they need including chats, meetings, calls, files, and tools. Integrated access through this hub for teamwork across multiple Office 365 services enables agencies to leverage their current investments and improves collaboration by providing central file sharing, co-authoring and many more functions making it possible for government customers to better deliver against their mission. Today we’re also announcing the availability of both Microsoft Power Platform (March 2019) and Dynamics 365 Customer Engagement (April 2019) for government professionals. These two new products will enable government to unlock new capabilities and features in three core areas: new business applications; new intelligent capabilities infused throughout; and transformational new application platform capabilities. Once agencies have the infrastructure for harnessing data, they also need a layer atop that data that enables them to get insights easily. Microsoft Power Platform for Government is a system that will allow them to take three key actions on data: analyze, act, and automate. The system uses Power BI, PowerApps, and Flow working together to help anyone, regardless of technical ability, to make data-driven decisions. Joining Power BI, PowerApps and Flow standalone apps are now generally available for government agencies and their partners in GCC. PowerApps and Flow general availability will also land in Dynamics 365, Microsoft 365 and Office 365 in spring 2019. We are also offering Dynamics 365 Government Customer Engagement for GCC High. This means agencies can now access customer service, contact centers, correspondence management, grants management, task management, mission planning and even more purpose-built cloud applications than they were able to previously. Recently we introduced Outlook Mobile for our GCC High and DoD customers. This update means the architecture of Outlook mobile now meets the security and compliance needs of Office 365 U.S. GCC High and DoD customers. Now government employees have advanced capabilities across email, search, and calendar from their mobile devices, so they can focus on what’s important and get more done for their citizens. Coming soon, government agencies using Office 365 Threat Intelligence in GCC will gain new capabilities that automate investigation and remediation of cyber threats to help them reduce the burden on their IT security teams and decrease response times. This is the latest addition to comprehensive set of Microsoft 365 Government tools designed to help government protect, detect and respond to cyberattacks. Microsoft is helping customers across the full spectrum of government, from the state and local level, to every military branch and all federal cabinet departments. We currently serve nearly 10 million U.S. government cloud professionals across more than 7,000 government entities diligently meeting their unique needs by deliver the highest levels of security and compliance. Microsoft enables the digital transformation of government by offering effective, modern, enterprise-class cloud capabilities. Our government customers are driven by critical missions, and we are committed to helping them evolve their IT modernization efforts with innovative and trusted cloud, productivity and mobility solutions. As government agencies face a range of new challenges in meeting their missions, we are committed to enabling them to work smarter, with agility and confidence – using technology that can unlock the opportunities ahead. Learn more about how government agencies are using Microsoft cloud technology here. As we shared on January 14, 2019, the end of support for Windows 7 is less than a year away. Many of you are well on your journey to migrate to Window 10 and Office 365, as they provide the most productive, secure, and cost-effective experience for users and IT departments. More than half of commercial devices are on Windows 10, which shows great momentum. We are here to help you every step of the way. The Modern Desktop Deployment Center provides detailed step-by-step migration guidance. We are seeing 99.9 percent application compatibility with Windows 7, giving you confidence to upgrade or buy new Windows 10 devices. The Desktop App Assure program provides dedicated engineering resources to help you remediate any application compatibility issues you might have. As we announced in September 2018, we will provide Extended Security Updates for Windows 7. Microsoft Windows Virtual Desktop (coming soon) will provide a Windows 7 device with free Extended Security Updates through January 2023, giving you more options to support legacy apps as you transition to Windows 10. As a final resource those of you with legacy Windows 7 devices, Extended Security Updates will be available for purchase starting April 1, 2019. They will be sold on a per-device basis for eligible customers and the price will increase each year. In addition, Office 365 ProPlus will be supported on devices with active Windows 7 Extended Security Updates through January 2023. This means that customers who purchase the Windows 7 Extended Security Updates will be able to continue to run Office 365 ProPlus. Please reach out to your partner or Microsoft account team for more details or download our FAQs for additional information. Now is the time to shift to Microsoft 365. National Bank of Canada—one of Canada’s leading integrated financial groups—set out to increase collaboration, speed up decision-making, and improve business results by reinventing their way of working. National Bank redesigned its headquarters, introducing open floor plans with no offices. All employees across business units can work together to deliver on strategic objectives, including the bank’s executives. But they didn’t just transform the physical environment, they embarked on a journey of digital transformation empowering their employees to drive innovation with Microsoft 365 technologies. The way National Bank encouraged all 23,000 employees to adopt these transformative digital tools is a fascinating example of innovative “low touch” change management. It was also confirmation of how empowering Microsoft cloud technologies really are. When National Bank began its cloud journey with Microsoft 365, a survey revealed most people were content with the existing workplace. Despite their satisfaction with the status quo, employees embraced the new tools because they valued them, not because they were required. We had a vision to transform how people work. By giving employees the highly secure tools from Microsoft 365, they have access to any information on any device, from anywhere, so they can work the way they want. To encourage adoption, we treated employees the way we treat our customers, using internal marketing, peer influencers, self-learning, and corporate social media to motivate everyone to download Office apps from our portal. With no formal directive, in just nine months 80 percent of the company had adopted new tools and were changing how they collaborate. And it only took six months for more than half of our workforce to adopt Microsoft Teams. As we transition into a cloud-first, mobile-first environment, we proved that people can work productively from anywhere with Microsoft 365. Continuing this digital workplace transformation, National Bank plans to incorporate intelligent search and artificial intelligence (AI) services next. I’m excited to see how National Bank continues to reinvent productivity and agility in the banking industry. Here’s a look at what’s new in February. New features and services help you better manage a complex threat landscape and communicate and collaborate securely. Extend your security team’s capability with Microsoft Threat Experts—Our new managed threat-hunting service, called Microsoft Threat Experts, helps you proactively hunt and prioritize threats to get the most out of Windows Defender Advanced Threat Protection (ATP). The service provides access to world-class experts who can help you work through tough investigation challenges with the new Ask a Threat Expert button. Go to your Windows Defender ATP settings to apply for the public preview. Empower healthcare professionals to securely communicate and collaborate—This month, we announced new capabilities in Microsoft Teams that enable secure messaging and collaboration workflows for healthcare organizations. Priority notifications enable clinicians to focus on urgent messages to manage patient care. In addition, the ability to integrate FHIR-enabled electronic health records (EHR) data with Teams enables clinicians to securely access patient records, chat with other team members, and even start a video meeting—all in one hub for teamwork. These capabilities are now in private preview; visit the Microsoft 365 and health page and partner site to learn more about how Teams and Microsoft 365 can empower your healthcare teams. Move confidently to the modern desktop and cloud with Desktop App Assure and Microsoft FastTrack—Our new service from Microsoft FastTrack, Desktop App Assure, provides app compatibility services for Windows 10 and Office 365 ProPlus. FastTrack also now offers guidance on how to configure Exchange Online Protection, Office 365 Advanced Threat Protection, Office 365 Message Encryption, and Data Loss Prevention policies. These services are now globally available to eligible customers with more than 150 seats at no additional cost. Sign in to Microsoft FastTrack and complete a Request for Assistance form to get started. Get security alerts for your Microsoft account on your phone—Receive security notifications for important events on your personal Microsoft account now via the Microsoft Authenticator app. When you receive a push notification, you can quickly view your account activity and take actions to protect your account if needed. Microsoft Authenticator can also be used to add two-step verification to your account for added security. To get started, download the Microsoft Authenticator app and add your personal account. New features expand capabilities to easily access all your apps and files, capture and convert data, and add context to your tasks. Jump into your work quickly with the new Office app for Windows 10—The new, free Office app provides a simple experience to get started with and get the most out of Office. Anyone who signs in with a work, school, or personal Microsoft Account can use it to quickly access all the apps available to them and their most relevant files and documents. Organizations can also take advantage of the ability to integrate third-party apps, enable users to search for documents and people across the organization, and customize the experience with their own branding. The Office app can be downloaded from the Microsoft Store, requires a current version of Windows 10, and works with any Office 365 subscription, Office 2019, Office 2016, and Office. Add data to Excel directly from a photo—Using the Excel app, you can take a picture of a printed data table on your Android device and automatically convert the picture into a fully editable table in Excel. This new image recognition functionality eliminates the need for you to manually enter hardcopy data. This capability is starting to roll out for the Excel Android app with iOS support coming soon. Quickly add photos and files to tasks in Microsoft To-Do—Attach files and photos to help make tasks more actionable with added context. 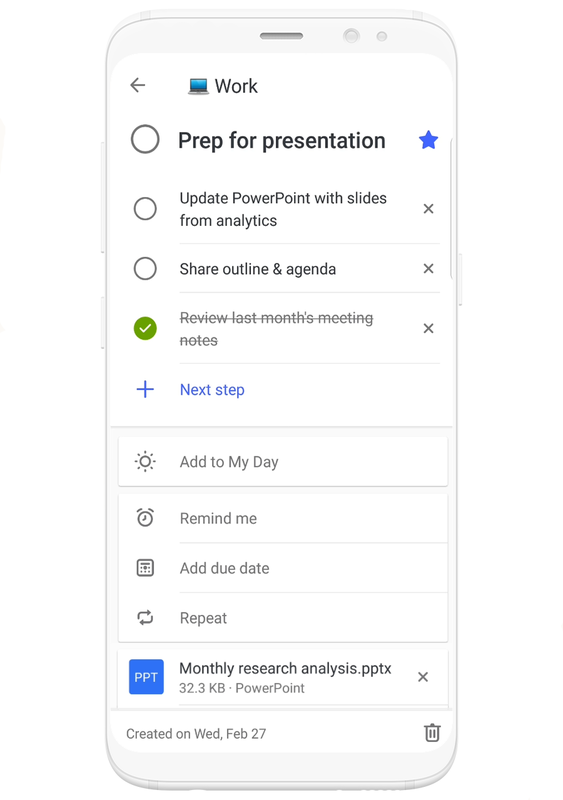 This highly requested feature is now available on all platforms and syncs across your devices, so you can take your new file-attached tasks on the go. New one-time passcodes (OTP) from Azure Active Directory (Azure AD) make sharing and collaboration seamless for any user with any account. Azure AD now supports automated user provisioning from Workday, enabling fast and efficient identity creation, so employees can access their Microsoft 365 apps and all other critical resources on day one. Starting this month, the Teams desktop app will be installed along with the rest of the Office 365 ProPlus apps for all new installs. Updates to the SharePoint Migration Tool make it even easier to bring your information to the cloud, with improvements like the ability to migrate web parts, pages, and site navigation. Enable Firstline Workers to communicate securely—A new, customizable Teams mobile experience lets Firstline Workers securely communicate and effectively collaborate from anywhere. This new mobile experience is a simple and secure, with several new mobile-only features that specifically benefit Firstline Workers, including location sharing and smart camera. Additionally, IT admins can now apply a prepackaged policy or create a custom policy to give employees role-based access to the Teams modules they need. The customizable mobile experience is now available for all Office 365 subscribers. Manage schedules directly in Teams with Shifts—Managers can create shift schedules and team members can update their availability, review schedules, and request time off directly in Teams. You can now integrate Shifts with your existing workforce management system through the Graph API for Shifts, available in public preview later this quarter. Free up space and easily access your files with OneDrive Files On-Demand for Mac—Files On-Demand is now also available for Mac, making it easier to access all of your files in Office 365 directly in Finder without taking up valuable storage space on your device. You can take files offline for when you’re without an internet connection and free up storage space when you no longer need a local copy of the file. Files On-Demand is now available to all customers running MacOS Mojave. Engage employees with new interactive visuals and features—Microsoft Photos now makes it easy to create videos with music and narration, text and filters, and even add 3D effects. In February, customers will be able to enhance PowerPoint content by adding Microsoft Stream videos into presentations. And coming soon, teams will have a new way to seamlessly add Microsoft Forms quizzes and polling directly into Microsoft Stream videos.